Sir – The Mutitjulu community, in the jointly managed Uluru Kata Tjuta National Park, today signs off on an innovative township lease that will put traditional owners and residents firmly in control of their future. This is a profoundly important settlement between residents and traditional owners – a negotiation about future roles and responsibilities for land use in a community that we hope will be widely emulated. Our model keeps decision making in local Aboriginal hands, but also acknowledges the need to build community capacity and strong governance. It allows for innovation and change in decision making processes under the Aboriginal Land Rights Act. Today’s 4pm signing ceremony follows the ratification of the sublease by the park’s board of management. Last December, traditional owners and the CLC agreed to grant a sublease until 2084, when the head lease of Parks Australia expires. The sublease must eventually transfer to a yet-to-be-established community corporation. This will happen when the CLC is satisfied that the new corporation has the capacity to manage the sublease. If the corporation runs into trouble, it can be transferred back to the Commonwealth’s Executive Director Township Leasing (EDTL). From today, the EDTL must consult with a committee of residents and traditional owners before making any land use decisions in Mutitjulu. For the first time, organisations such as the clinic, the school, the store, or a community housing provider will be given legal permission to occupy premises in Mutitjulu and start to pay rent. 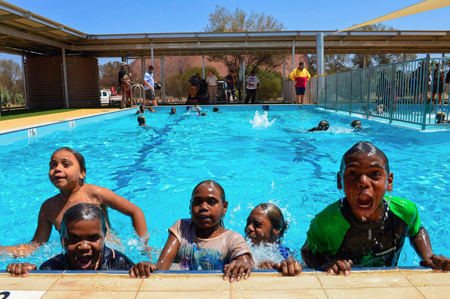 These rent payments will fund community-driven projects similar to the Mutitjulu pool and the many other successful projects pioneered by our community development program. There will be no rent payments to individuals and Parks Australia will not charge rent for the sublease. We welcome the additional benefits the Commonwealth has agreed to make available upon signing of the sublease, such as the $10m investment in community housing, modest accommodation for visiting traditional owners, and $2m for a community business centre. PHOTO: Income from lease payments will go to projects such as the pool.